May we please have the option to increase the sound of foot steps? Unlike those who complained about foot step sounds, I personally never had a problem with them. The issue now is that I cant hear anyone until I am dead. Everything you have done lately has done nothing but nerf the MMG playstle, from the nerf to the recoil and bullet spread, to the buff to flares (prone player suffer the most by this), to the change in foot step sounds (I don't hear anyone until I am already engaged in combat). Please give those of us who MUST hear footsteps the option to do so, right now they serve no function. I'm still hearing them all the time with headphones. Ditto. If those godzilla footsteps come back, im out. I hear them, but sound placement is so off in this game I still regularly have trouble finding out where the noise is coming from. It's like night and day from this to BF1, I don't understand why the sound design feels so off in this game. 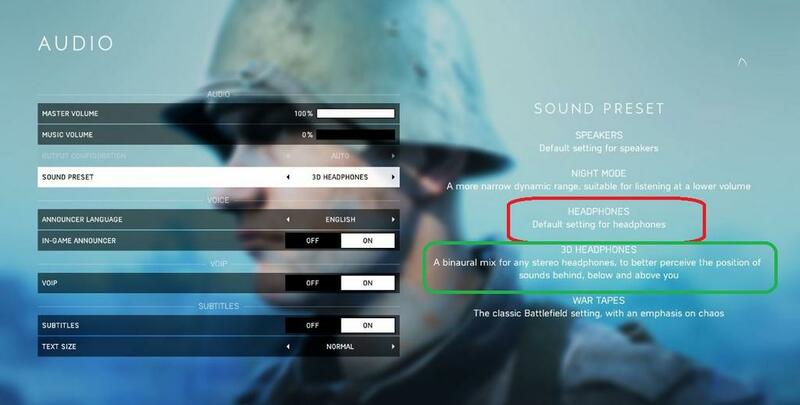 Not trying to be funny but You might want to check your in-game sound settings or upgrade your headphones/speaker setup. Is this for console as well? I have been hearing footsteps, but like OP and VVaxDaddy, its hard to tell if they are coming from left or right. If I'm hiding behind something and the enemy could come from one side or the other.. I have relegated it to a coin-flip.. just face right or left and hope it was the right choice. When I get meleed, I know it was the wrong choice. Oh cool, I found it. Thanks @TamKingski I had been using the default headphones setting all this time! Dude.. that was so much better... I could hear where footsteps were coming from. Sure, let's add an option to make it easier to locate enemy players. Why not? I can't see anything wrong with that. Footsteps now are in great spot. I can hear enemies and i know how far and wich direction. You mean like lowering your graphics to see them better? Not really a good argument. Yes,i dont know about xbox but ps4 def has these sound options too. Its worth checking your ingame sound options as the last patch apparently reset some game settings to default,so could be why some are having trouble telling the direction of footsteps. As i said before if you have headphones i highly recommend the 3d binural option. 3D sound is alright for footsteps but everything else sounds like a word I cant use because forum police will ban me again. I would like a slider to adjust the mid range then everyone can set footsteps to there own preference. I thought about that, recording the sound of footsteps and opening that up in audition, checking the frequency response then buidling a parametric EQ to boost that frequency in game. With everyone saying that footsteps are fine, it occurs to me that I may have some hearing damage that makes it so I can't pick up that particular kind of noise. I hear footsteps just fine in CoD and PUBG, but I am completely 100 percent deaf to them as it stands now. Can't even faintly hear them. I could hear them when they made them louder, but not now. I have a Sennheiser pair of headphones, which I've heard is pretty good for picking up those types of noises, so I guess I'm hard of hearing. No, they are blatantly obvious. Default windows 10 usb audio driver for my headset and mic work perfectly (usb sentey 4370gs). I hear everything perfectly, the LOUD steps they had before were aweful. They are in a perfect spot right now. Tried using the 3D settings but I found it a little harder and I was used to the default settings. I feel like the sound and locating players in this game is top notch, way better than other games I play. It does feel immersive in this sense. Sorry for those having issues. My suggestion is check your drivers and test with speakers and other devices to see why it's not working as intended. I hear footsteps fine through my SteelSeries Arctis Pro headset. I also don't have much trouble hearing them straight throw my Logitech THX speakers. I think they're loud enough personally.